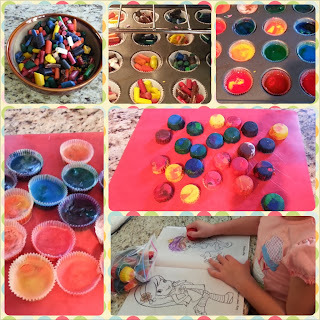 2) After peeling them all, we broke the larger pieces into smaller pieces that would better fit into each mini cupcake tin. 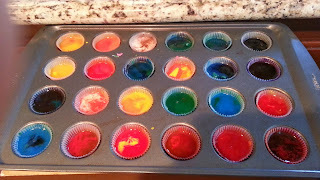 3) After breaking down all of the crayons, we put 2 liners in each of the cupcake tin spots. 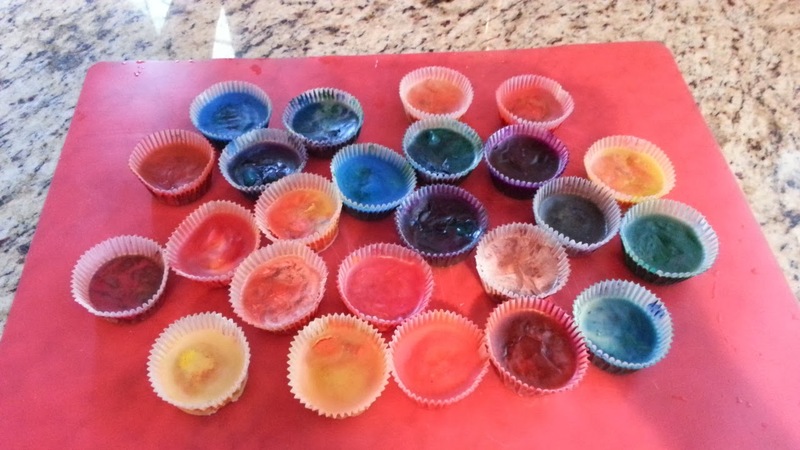 If you only put one, the crayons will leak through and it will be difficult to clean and reuse for actual baking next time. You can also use the foil liners. 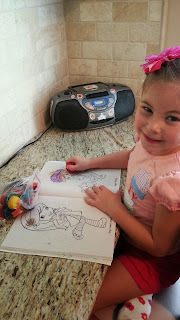 They are thicker and the crayons don't bleed through them like they do the thin paper ones. 4) After you've lined the tin, turn the oven on to 200 degrees. It won't take long to heat to such a low temperature so I usually wait until this step to even turn it on. 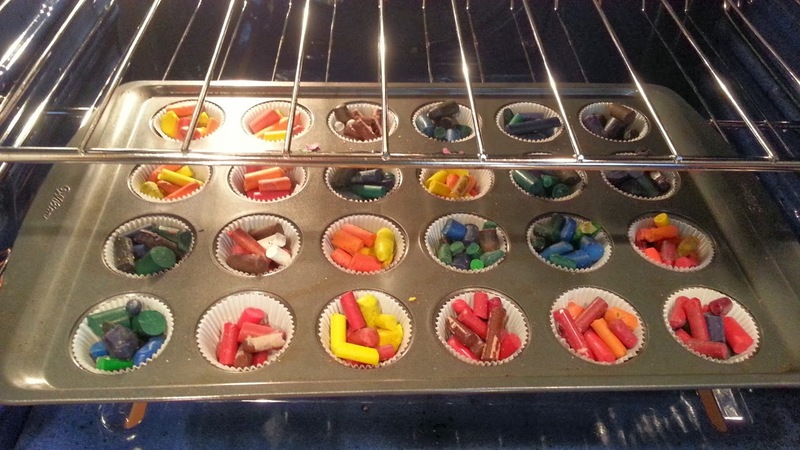 5) Once the oven is on, add the crayons to the cupcake tin in any combination you'd like. 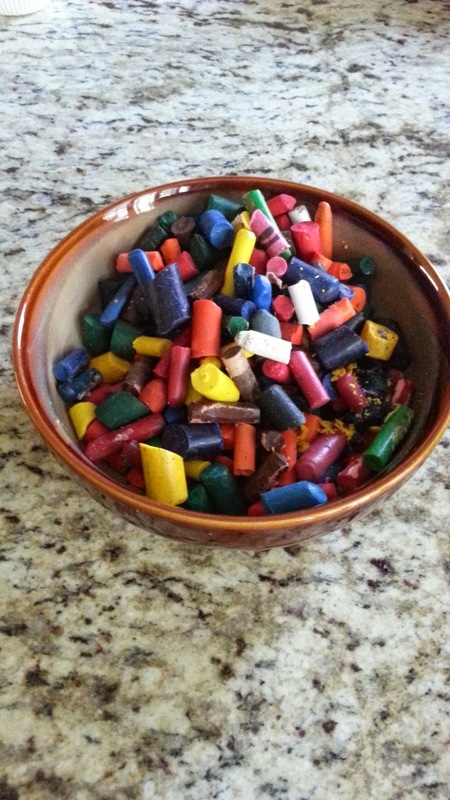 You can make some solid color crayons and you can mix colors as well. We kept color families together but made some cool combinations as well (orange + yellow, red + purple, blue & green, red + orange, multi-color). 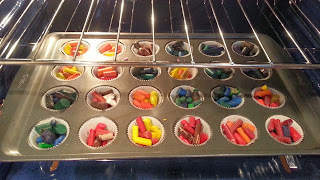 6) After the tin is full and/or you're out of crayon pieces, place the muffin pan in the oven and "cook" for about 10-15 minutes. Watch them carefully so they do not overheat or burn. The smell is not great but it will be worse if they burn. They will also stick more to the pan. 7) When you remove them, make sure to do it carefully and slowly. 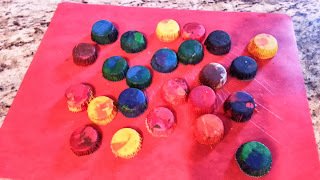 The crayons will be a thin, watery liquid consistency and can spill easily. 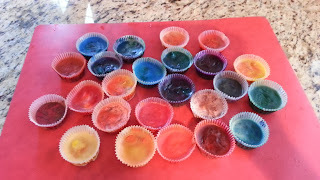 Let them cool for about 30 minutes and remove them from the tin. 8) After they have completely cooled, remove the cupcake paper/foil wrappers and they're ready to be used! My daughter absolutely loves them and doesn't even want to use her regular crayons anymore.